DIRECTIONS: This private cemetery is located at the intersection of County Rte. 4 and County Rte. 3 (Cooks Corners Road). It is in a farmer's field and is visible from the road. This cemetery was originally compiled by Harland R. Horton, Franklin County Historian, on July 17, 1967. Photographs were taken on 4 December 2000 by Joyce M. Ranieri. This cemetery was restored and is maintained by the Ft. Covington Comets 4-H Club. 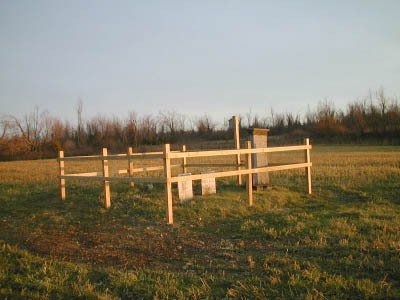 Elizabeth MOUNT, co-historian of the Town of Fort Covington in 2003, was told there were 7 people buried in this cemetery. Click here to read an article about the cemetery which appeared in the Massena N.Y. Observer on Tuesday, November 25, 1980. AE 91 (94?) Yrs. & 5 Ms.
Back to thy Maker's hand. We bow at his command.